This is a very fun magazine and is published on high quality glossy paper with sixty-two pages of tractor information and the tractor people who love Fords and Fordson tractors. 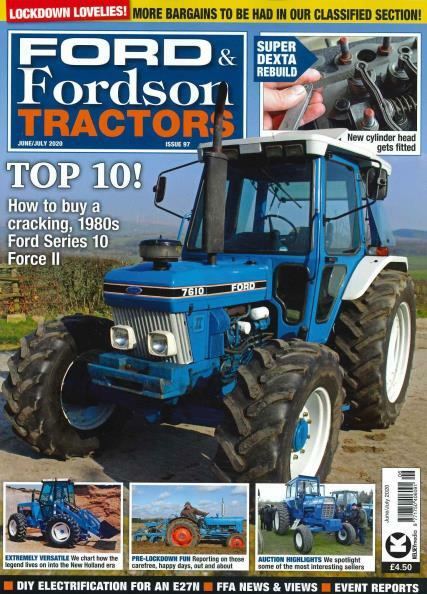 Buy a single copy or subscription to Ford and Fordson Tractors magazine. Ford and Fordson Tractors Magazine is a bi-monthly publication and there are contributions from well-known authors from all over the world. Sections include “Down in the Workshop”, “Members Tractors”, “Collectors across the World”, and the “FFA Model Corner”. Read about F/F histories in the section titled “Memory Lane”. This magazine is an incredible fun read. Read and sign up for the Ford & Fordson Northern Area Plowing Championships on Sunday November 4th. All members who have a Ford and or Fordson tractor are invited to enter - no qualifying needed! All you need is a vintage tractor, spares, and maybe know a bit about agriculture and how to drive a tractor and plow a field. One sponsor, Silver Fox Tractor Spares, Ltd is a supplier of Ford parts. This company has fixed and repaired Ford and Fordson tractors for many generations. If you bring in a copy of the magazine, you may get 10 percent off any purchases! For sure if you are a member of the FFF Club you will get preferential treatment.